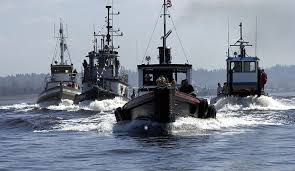 You won’t see any of our 22-vessel team competing for maritime gold like some of their stouter cousins plying Puget Sound. Our ships prefer the hard-working life of connecting communities and transporting goods day in and day out along our state marine highways. 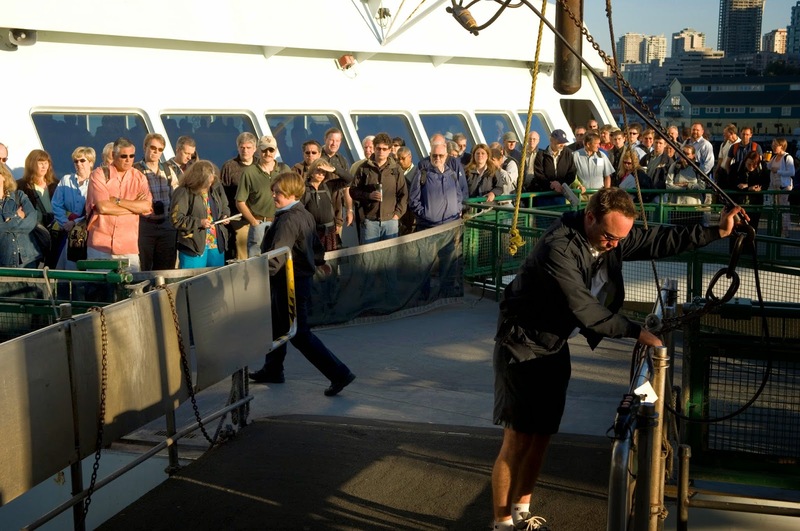 22.5 million riders and 10 million vehicles - What Washington State Ferries carries every year. 7 days a week, 21 hours a day – The hours we’re on the job. 1800 crew members, 450 departures a day from 20 terminals on 10 routes – That’s how we roll. Let’s face it, the average age of our vessels is 38. Many are pushing 50 years old or more. Sometimes, no matter how careful we are to keep our vessels in working order, things can happen. And sometimes those things happen on multiple ferries at the same time! What happens when we’re down a few good ferryboats? Our fleet is designed to keep a full-service schedule even if one or two vessels are out of service. If more than two are out of service at the same time, we do what we can to restore service to as many customers as possible. Moving ships or cancelling service is not a decision that we take lightly. We try to match the largest available vessels to the busiest routes. For example, in July, when the 202-car Tacoma lost power on the busiest commuter route in the system (Bainbridge Island-Seattle) we moved the 202-car Puyallup from the Edmonds-Kingston route to make up the difference. We also ask ourselves, “Is there an alternate route?” Ferry service saves commuters time by zipping across the water instead of driving around the long way. In some cases, however the long way takes hours to drive, or is a non-existent route as in driving to the San Juan Islands. During times of reduced service, we prioritize active vessels to ferry routes that don’t have viable alternate ways to get to a destination. Throughout the day – Crews constantly monitor systems, perform routine and preventative maintenance and keep the ship in ship-shape. On a weekly basis – More of the above, including tending to long-term projects such as tearing apart an engine for deep cleaning. 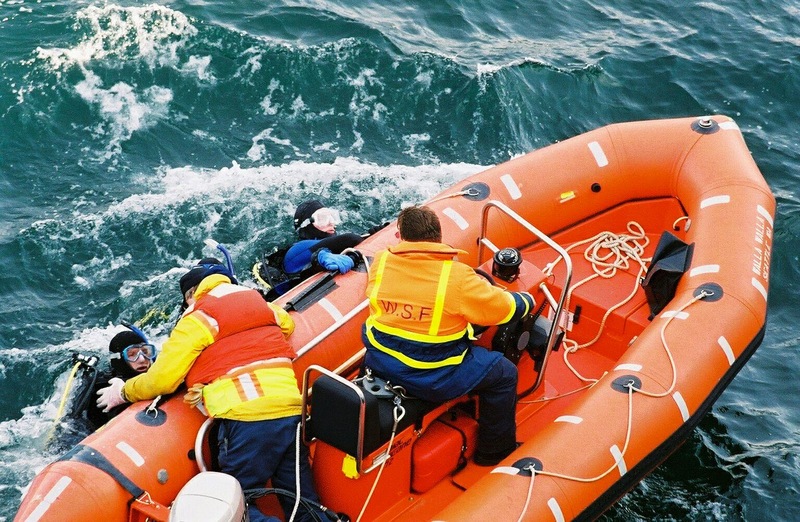 Quarterly inspections– Four times a year the U.S. Coast Guard checks all of the safety and life-saving equipment on the ferry to make sure it is in working order. 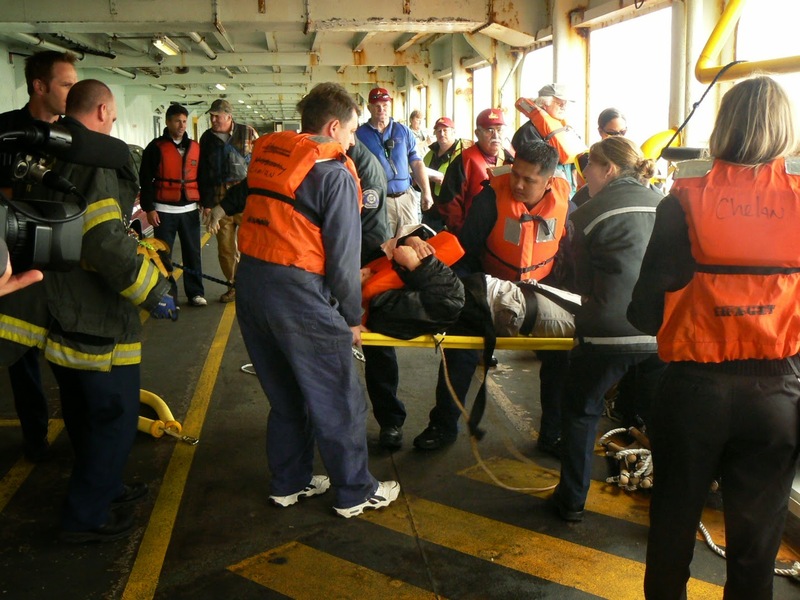 The inspection also requires crew members to perform passenger safety and emergency rescue drills like the one pictured below. 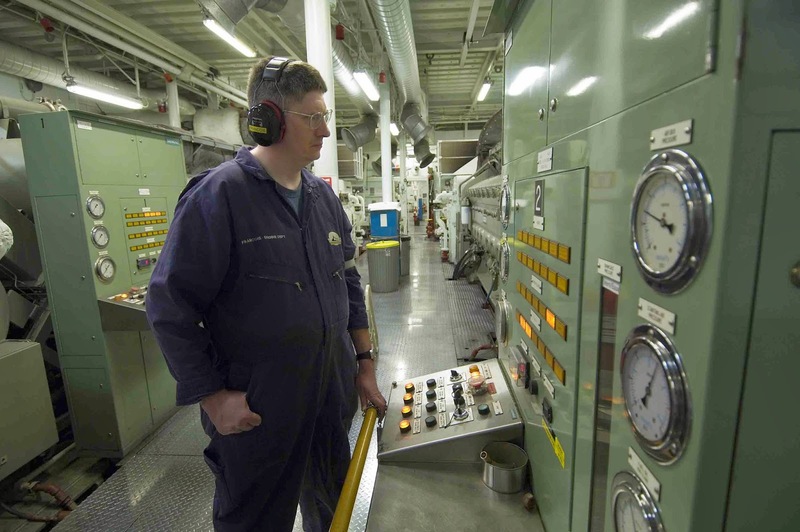 Annual inspections– Just like a checkup at the doctor’s office, the ferry is evaluated from end to end, including the hard-working engine room. If the U.S. Coast Guard finds anything out of order, we tie-up the ferry and make repairs before returning it to normal service. The “2 and 5” – Every two and five years, we take the ferry out of the water for a few weeks for a U.S. Coast Guard inspection. The looksee includes everything inspectors would normally comb through during the annual, plus the exterior hull and propulsion system. 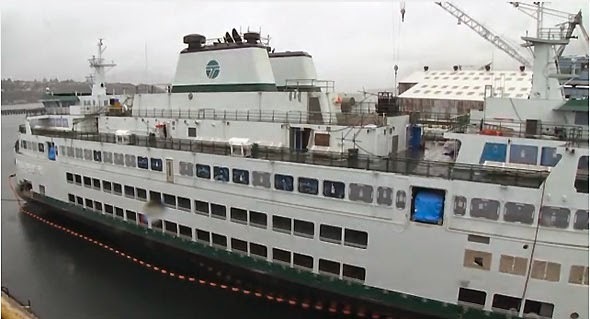 Painting O’ the ferry – Alas, when there’s enough funding in our maintenance coffers, every few years we carefully blast off the old paint and apply a couple new layers of white and WSDOT green. The painting of the ferries guards our vessels from the ravages of rust so they can be better prepared to take on years of winter rainstorms. Our ferries aren’t complete without its dedicated crew. Some employees work an 8 or 9 hour shift several times a week, others, like those in the engine room, work a 12-hour shift (day or night shift) for seven days in a row. They have a week off before returning to work the opposite shift for another week. Crew members alternate between day and night shift every other week. All told, our 1800-person staff is just enough to cover all of the positions required to keep our fleet operating at full service. However, just like the rest of us, sometimes crew members get sick, or stuck in traffic, or have to attend to an emergency and are late getting to work. Many traditional workplace environments can accommodate flexible schedules and last minute emergencies. 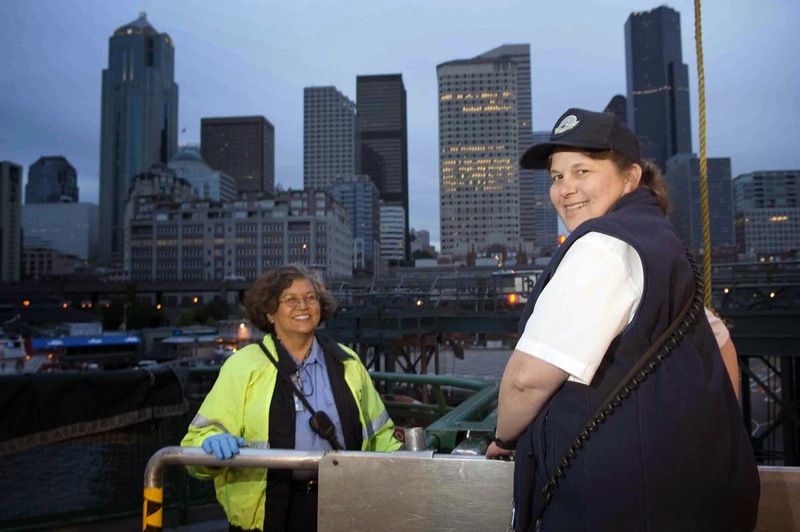 At Washington State Ferries, if every assigned crew member is not at their stations at the start of the shift, the shift can’t begin. We’ve got schedulers working around the clock filling regular service shifts and fill-in shifts for sea-going employees on vacation or at a medical appointment. Nonetheless, filling vacant shifts within our fleet is challenging, particularly during the peak summer travel season. We are doing the best we can with the resources we have, including providing crew members with additional training so they are qualified to fill a wider variety of shifts. First mates to oilers, it’s the norm around here to work overtime. 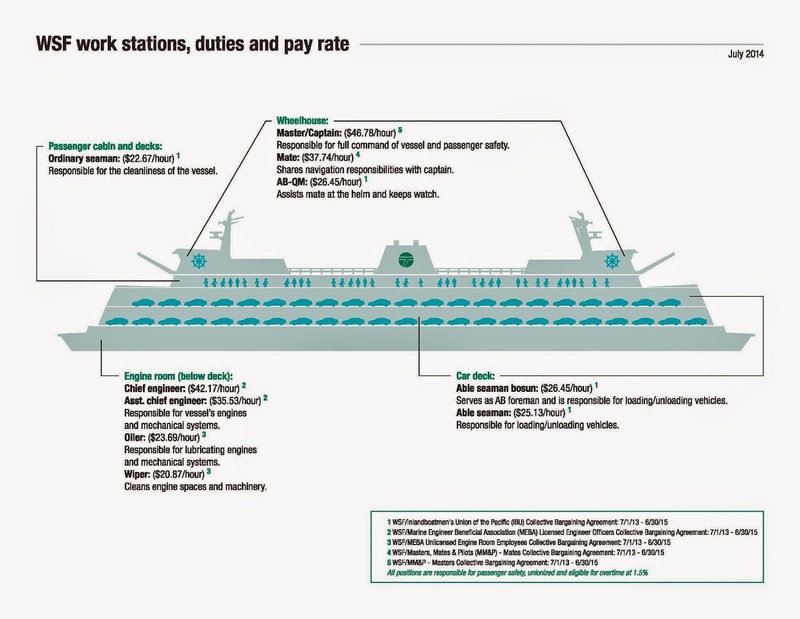 If you ever wondered what it takes to run a ferry boat, here's an overview of work stations, duties and pay rates. This example is for the Issaquah class, the hardest working boat in the ferry business. Your state ferry system has an overall service record of 99% reliability across the board. While we feel that is a strong record, it doesn’t minimize the real impacts that people like you experience when we do have incidents, and we sincerely apologize for that. We know we've been having some challenges this summer and we appreciate you bearing with us. Interesting fact: Most U.S. airline carriers boast a 78% reliability. We’re on course to provide the best service we can with the resources we have. 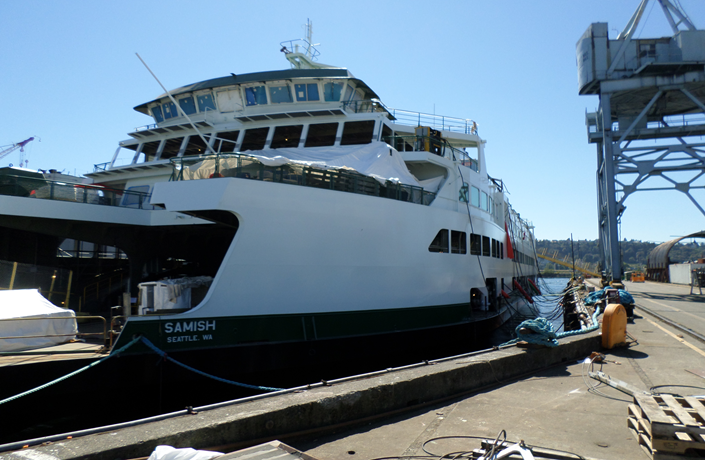 Right now we’re in the thick of building the Samish, our second of three new 144-car ferries. Starting in January 2015, we’re expanding Save A Spot, our vehicle reservation service, to the San Juan Islands route. We are committed to getting you where you need to go safely. A big thank you goes out to all of our customers. We appreciate the opportunity to serve you. This entry was posted on Friday, August 8, 2014 at 9:57 AM and is filed under ferries, ferry, ferry crew, ferry painting, Puyallup, Samish, Save A Spot, state marine highways, Tacoma, Tokitae, Washington State Ferries, WSF. You can follow any responses to this entry through the RSS 2.0. You can leave a response.